Vernon Hills, Ill., August 10, 2011—For a premium selection of fluid handling equipment and supplies, consult the newly released Cole-Parmer® Fluid Handling System Sourcebook 2011. Researchers, technicians, and engineers will find a variety of Masterflex® tubing pump systems, along with gear, metering, Ismatec®, positive displacement, and vacuum pumps in the catalog. Thermometry, flowmeters, filtration, lab consumables, mixers, heating equipment, water quality products, and more also fill the 144-page book. The latest products featured include the new Masterflex® L/S® Precision Variable-Speed Console Drives with precise speed control and digital display of rpm, ideal for metering applications. The new Masterflex® Puri-Flex™ Pump Tubing is designed for high-purity applications that require non-DEHP and animal-derived ingredient free components. Oakton® Benchtop pH/CON 700 Meters offer conductivity and TDS autoranging, choosing the best resolution for each measurement. Users can easily toggle between pH, mV, conductivity, TDS, and temperature measurements. 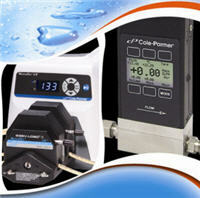 To see these and many other products, request a FREE Cole-Parmer® Fluid Handling System Sourcebook 2011. Simply call 800-323-4340 or visit ColeParmer.com/18682. Cole-Parmer has been a leading global source of laboratory and industrial fluid handling products, instrumentation, equipment, and supplies since 1955. Our product lines, including popular brand names such as Masterflex®, Oakton®, and more, are sold through company-owned customer channel outlets and a strong network of international dealers. We also feature an ISO-17025-accredited metrology lab for instrument calibration and repair. Cole-Parmer responds with excellence to customer needs, and offers application expertise and technical support. For more information, contact Cole-Parmer, 625 East Bunker Court, Vernon Hills, IL 60061. In the US, call 800-323-4340. International customers, call 847-549-7600. Visit us at www.coleparmer.com.